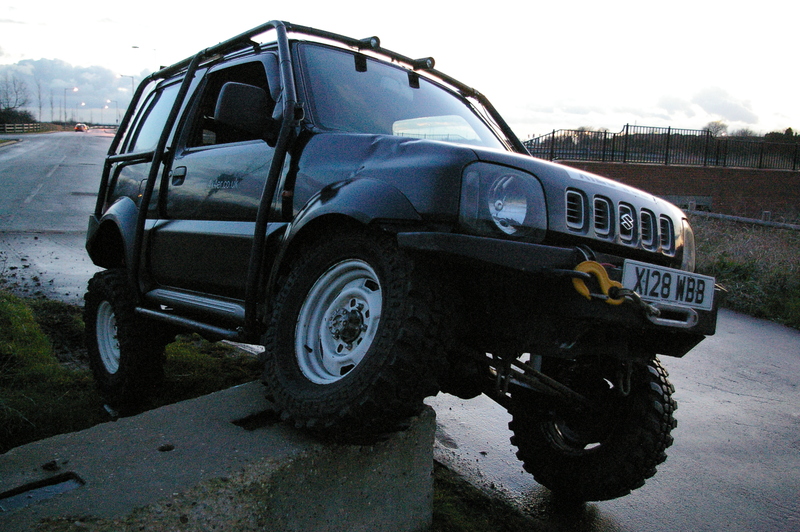 I don't regularly post pictures of my Jimny as there has not been much change for some time. It had come quite a way already with a cage, winch bumper, winch, ORA rear bumper, 3" lift, Rocklobster, 16" GV wheels with Kumho muds etc. Recently though, I've had a few more additions - X-Lites from X-Eng,Waffle Board and Ground Anchor mounts on the roof and a set of 215/80/15 Malatesta Kaiman tyres on an old set of SJ van rims. The wheels might not be to everyone's taste and I think they are a bit Marmite. 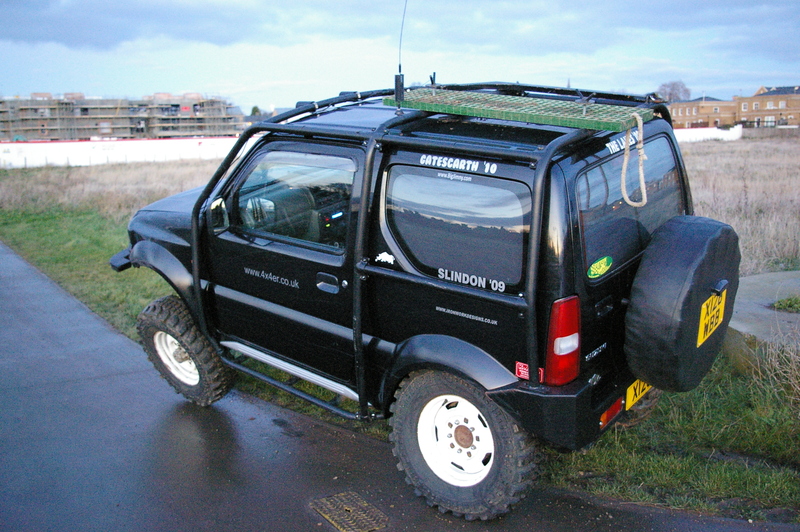 I had got a set of Jimny steels but as the tyres were being fitted one of them was found to be buckled - so I fished these out of the garage so I could run the tyres. I like the wheels and think they make the truck look a little less cutesy and a bit more purposeful - anyway - I can't keep buying more sets of wheels but will at some point get some more Jimny steels and get them swapped. Bar lockers and more winches which I can't afford - I think this is as good as it's gonna get - other than perhaps an internal diagonal to connect to the exo cage and chassis via sandwich plates at some point. Oh... I need to extend my rear bumpstops too as the tyres rub the plastic arches and the bodyshell part of the arch under full articluation now. The Woffle Board mounts are just tabs welded to the cage with studding bolted up through them and bent rods welded to nuts for me to be able to screw them down to fasten them. The Ground Anchor mount is a hoop at one end welded onto the cage to hold one end in position and a tab welded to the cage and the anchor with studding bolted to the tab and again a nut with rod welded either side for me to tighten up to keep it in position at that end. The theoretical maths says that these tyres should be 9.4mm smaller than 205/80/16's - the reason why I got them over 205/80/16 Insa Turbo Special Tracks. I've got a spare set of 5 GV wheels in the garage too! Forget trying to work out how big an extreme patterned remould will end up being - these measure the same as my mate's old 205/80/16 Insa Turbo Special Tracks! So I might as well have got them and stuck them on my GV wheels - but you live and learn! It's just a good job I had a spare set of 15's! 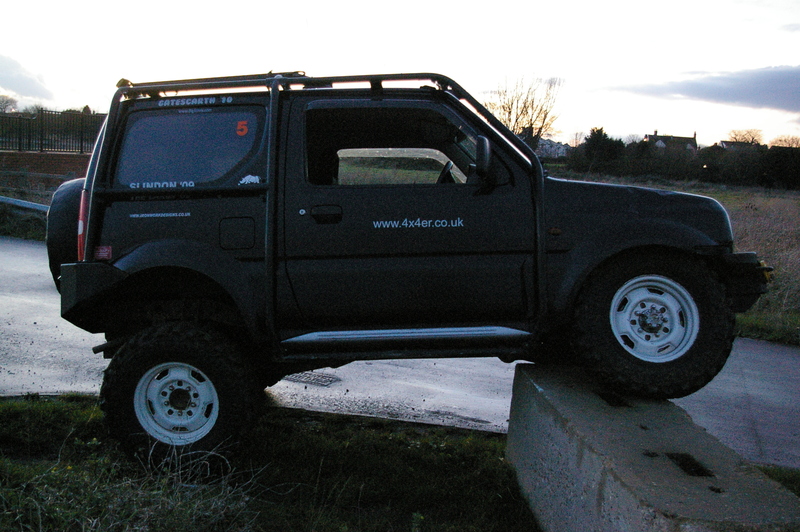 I've yet to take it off road with these tyres other than the poser shots due to the bump stops needing extending. I'll take more picatures when I do though! I'm expecting the difference in grip from these and the Kumho's to be like night and day! Last edit: 08 Jun 2018 14:16 by kirkynut. which land anchor is that and where do you stow the blade? 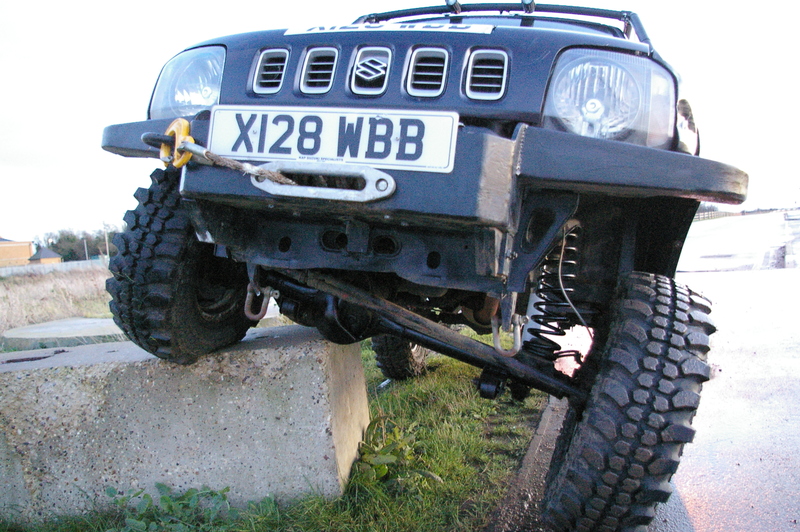 The ground anchor is made by the same chap who made my cage, winch bumper and rocksliders. It's based on a design from a well known Landrover of road accessory manufacturer but down sized to be a bit more suitable for smaller vehicles like ours. I keep the blade strapped down in the boot between army style kit bags that are strapped down to stopstuff flying about offroad or in event of a - dare I say it - Roll! I've yet to use it in anger but have seen them used so know it'll work. I've not used it yet as it's too big to carry in the car so has lived in the garage till now! I figured that there is no point in having it if I don't take it out and have it to use when the need arises - which it has! I looked at the way challenge trucks have theirs fitted and don't like that mount it out the front thing they do - I want to be able to carry it whilst I'm on the road too and outside the car. On the way to off road sites for example. 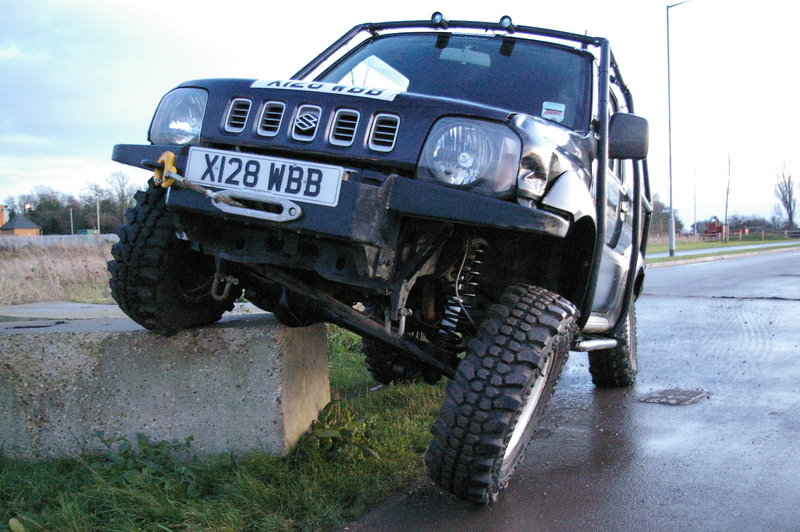 I was conscious of adding weight high up to raise the centre of gravity but the Jimny is so small there are limited places to put it and woffle boards. So the roof was the only place. I've seen others on the spare wheel holder but my spare wheel lives there as I want to keep my rear seats too - it's all a compromise as with modifying any car for any reason. Last edit: 19 Dec 2014 09:45 by kirkynut. i like the rims, look good are they wider or lower offset then the jimny steels ? Tyres, yeh you just have to look at that pattern to know they are going to work... Id like some maybe on a spare set as you say but wouldnt fancy driving on them daily...? How do they behave ON road? 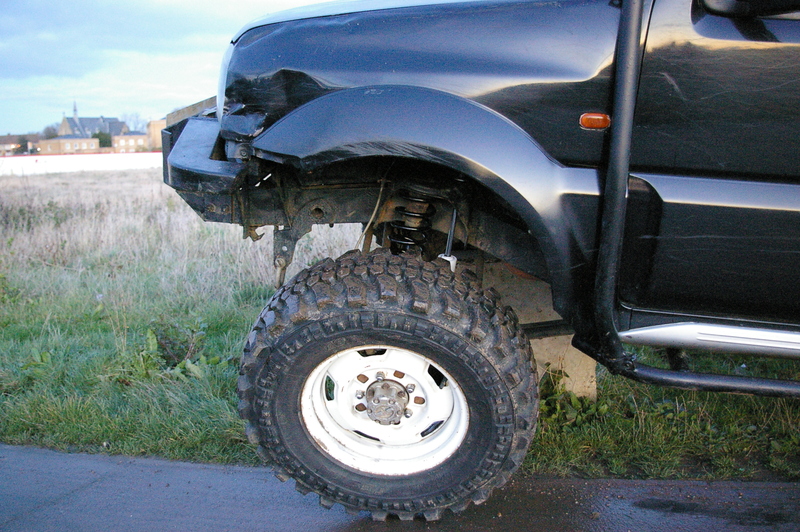 biggaz wrote: i like the rims, look good are they wider or lower offset then the jimny steels ? Cheers! The rims are the same offset as normal SJ rims - the weller 8 spoke design - and according to our club's resident mobile tyre fitter, Kev, they sit 5mm further in than the Jimny steels from what his balancing machine says. Again - this has a detrimental effect on how the centre of gravity effects the truck but the tyres originally on the car were 205/70/15's so the extra 10mm width on these tyres evens the lesser offset on the wheels exactly - or that's how I console myself anyway! I have spacers but they would put the tyres outside the arches - the widths are much wider than the sidewall says, so I'm gaining more width that way too. You really can't expect these extreme remoulds to be anything like the numbers say they should be sizewise! They behave OK on the road in the dry. I've not driven them in the rain yet but needless to say - the 2 second rule will become the 8 second rule I think! I can't wait to get my rear extended bumpstops made up and then I shall see what the grip is like - but like you say - you just have to look at them to know they are gonna grip. Finally I'll have the same grip the others I offroad with have on their Green Ovals. looks nice, have you had any issues with the tyres catching? viciouspenguin wrote: looks nice, have you had any issues with the tyres catching? The fronts caught a little on the plastic wheel arch liner as it has a fin shaped part inboard. I zapped that off with the angle grinder quickly as I wanted to leave the arch liners in. The rears - well they catch on the actual inner wheel arch of the shell! They also catch a little on the plastic arch but that is the least of my worries with them touching the inner wheel arch! It's no great issue though, extended bump stops are easy on the rear so once they are done all will be well! Love the Tyres .. they are next up for ours ... as soon as the Lobster box is delivered and fitted that is. How do you find the X Lights ? do you have fog or spot pattern ? I looked at those for ours too. ooky_123 wrote: Looks good mate. They are the flood ones but I've not used them offroad yet to give you a verdict. Realistically I won't until our club trip to Slindon in Sep when I might hold back on the beers till we've done a little night driving. I'm happy with them though. I just realised that you don't have a cage Jason, so all my faff about how they mount to mine is no good for you. The other type of mounting they do I've not seen but I can't see that the casing of the lamps will get broken so tree branch damage will depend on what you bolt them to as it will be what you bolt them to that will bend, not the lamp! 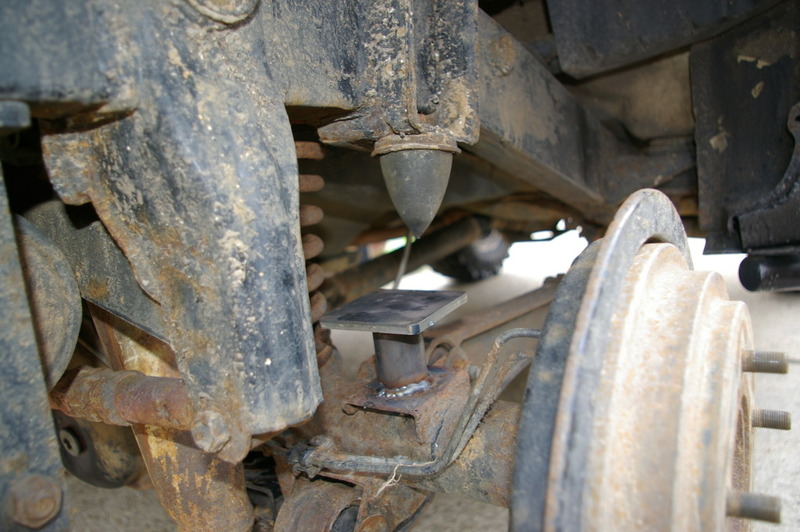 You can see that the original bumpstop is mounted by a single bolt going down through the mounting on the chassis into the bumpstop and that this is all that fastens it to the car. So this leaves 2 options of how to extend you bumpstops. The first, simply unbolt the original, space it with however much you want to extend it by using tube, box section with a hole driled through or whatever and a longer bolt. The second, weld / bolt something to the plate the original bumpstop would hit, to raise that platform by however much you want the bumpstop extended by, ensuring the raised paltform will be in the right place for the bumpstop to hit. The first sounds the easiest and in theory is - except for rust. The bolts on mine are seized in place and you can't get a grinder in to take it's head off and extract the rest of the thread once it's on the bench. Nor can you get a socket on the top as it's too close to the chassis. I don't think I could even get a ring spanner onto it. So I tried the open end of the spanner and predictably rounded the head of the bolt off. You could chisel the head off the bolt if you want to but then if you can't extract the bolt from the bumpstop you'll end up destroying the bumpstop. So I had my fabricating friend spend just a few minutes making up a mushroom from tube and plate and welding it al together onto the plate the bumpstop would normally hit. If this sits too high I can shave some of the rubber off the original bumpstop. If I ever become unhappy with this arrangement I can buy a new bumpstop, whether it be a nylon one designed for another car or an original Suzuki one and grind off the extension I've had welded on. 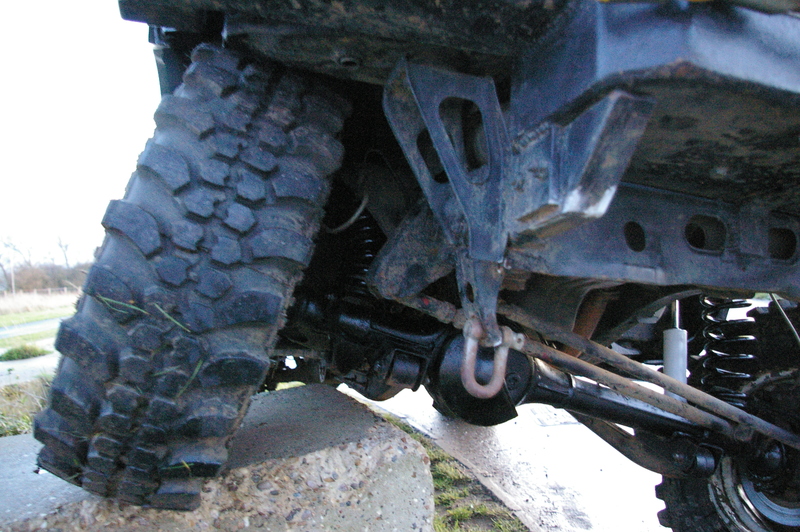 However, you still achieve a massive amount of suspension travel despite the reduction caused by the bumpstop extension and it's appearance is deceiving in this respect. When on my smaller tyres, they got pushed right up into the arches at the rear and never caught on anything - to my knowledge - but I have no options with these tyres but to run the extended bumpstops. 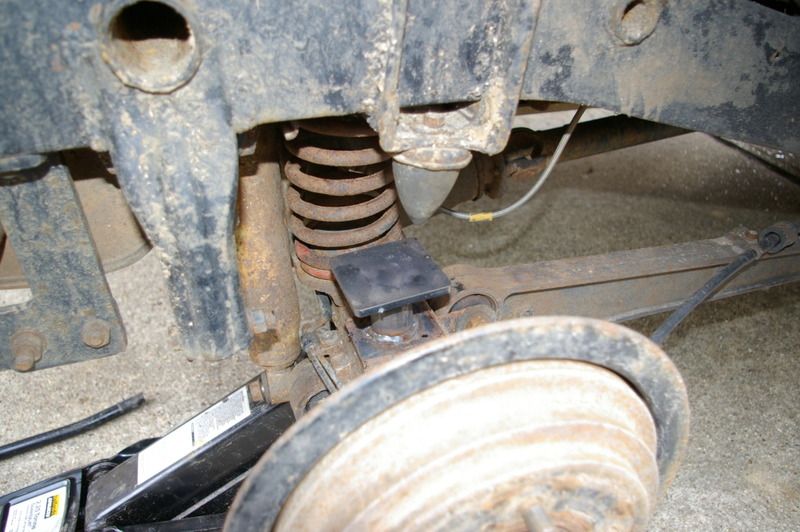 I am aware that it will now mean that when the bumpstop hits it's stop, the body of the vehicle will be raised if the sideslope gets steeper, instead of the spring just compressing more, so this will have to be bourne in mind as the chances of a roll could increase. 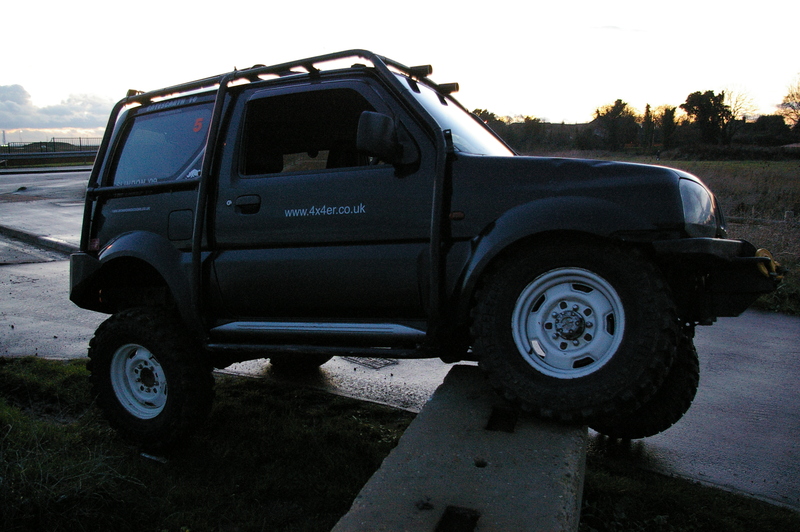 I am also aware that I've not made the vehicle wider, so will have to be sensible on sideslopes. 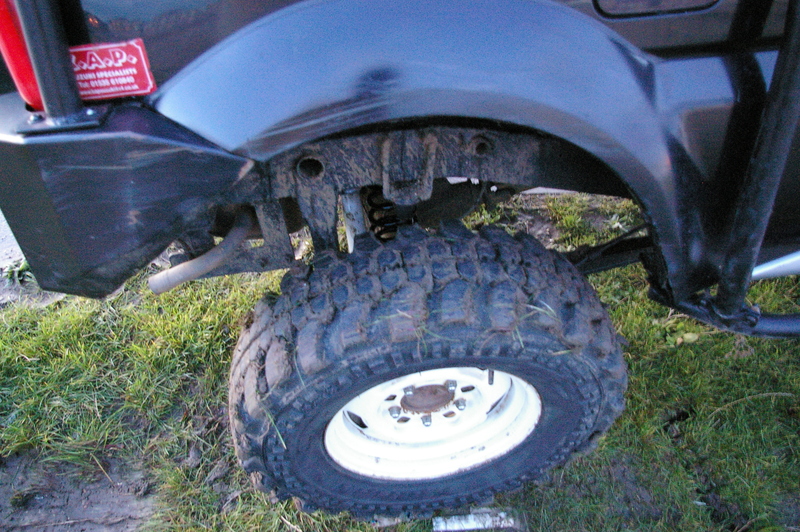 Generally though, my bottle has gone before it becomes an issue but things don't always go to plan, especially in splippery mud on steep banks when there is not enough grip to place the vehicle where you want it and you slide uncontrollable sideways and end up at an angle you did not want to be at, or plan to be at! We'll see how things go when I get off road next and go from there. I have wheel spacers if needed but worry about the wheels catching the outside of the arches on ful articlulation. Some experimentation may be needed. Last edit: 04 Aug 2017 20:12 by kirkynut.